Like Jennifer Lawrence’s fall at the Oscars, unexpected but a chance to shine ‘comedically‘, Italy’s elections have shocked investors but provided attractive entry points to strong international firms, insulated from domestic woes (as well as offer up some funny one-liners from candidates). The possible loss of eagerly anticipated labour reforms, financial restrictions and market contagion provide shorter term sources of turmoil. However, existing reforms are likely to continue, market retrenchment is healthy and to be exploited for longer term opportunities. Gemma Godfrey highlights the factors that could cause a pullback in markets and provide buying opportunities, on CNBC’s Fast Money. Published on cnbc.com by Bruno J. Navarro. “Disappointing growth in Germany, the potential for political deadlock in Italy and corruption allegations in Spain appears to be increasing risk. Market elation has been a little bit too early, moved a little bit too far, and there are these potholes that actually could cause markets to stumble, at least in the shorter term. Markets do not like uncertainty, and the longer this continues, the longer the uncertainty is over the markets, the more likely is it will have a pullback. The U.S. stock market is approaching 500 days since a 10 percent-plus correction, which she said was the tenth-longest time in history that such a bull run has occurred. And it means when we’re looking at where valuations are , they’re no longer cheap with respect to the U.S. market, growth isn’t coming through as we thought it was going to come through, and you’ve got this level of uncertainty, meaning that it is more likely that these momentum followers – for example, the hedge funds are buying into financials – that they’re going to start to stumble. But I do think that that means if we do see a correction, it could be muted because it’ll be a fantastic buying opportunity for those investors that are looking to rotate back into risk assets because over long-term, we’re actually more bullish about equities. Low interest rates, credit spreads at multiyear lows and the prospects of a return to growth could still bode well for equities. What the market needed was confidence and the return of depositors to put their money into European banks, something that hasn’t happened sufficiently. Can Stock Markets Continue Their Recent Rally? Gemma Godfrey, head of investment strategy for wealth management firm Brooks Macdonald, argues that the small drop in US economic output shows investors may have got carried away in recent weeks. As investors dismiss the economic contraction to focus on the resilience of consumption, they miss the risk that this will come under pressure over the coming months as fiscal cliff measures come into play. Market rallies have been driven by the fear of an imminent risk receding, but growth is now needed for another leg up in markets. Instead, the ‘pain trade’ is now missing out on equity upside, implying fear of underperformance may be driving investment versus conviction in the outlook for markets going forward. Exemplifying this is the recent rotation by Hedge funds into financial stocks, following the positive earnings momentum, which of course is backward over-the-shoulder looking, rather than based on confidence in the future. After hitting multi-year highs, can the FTSE 100 continue its recent rally? 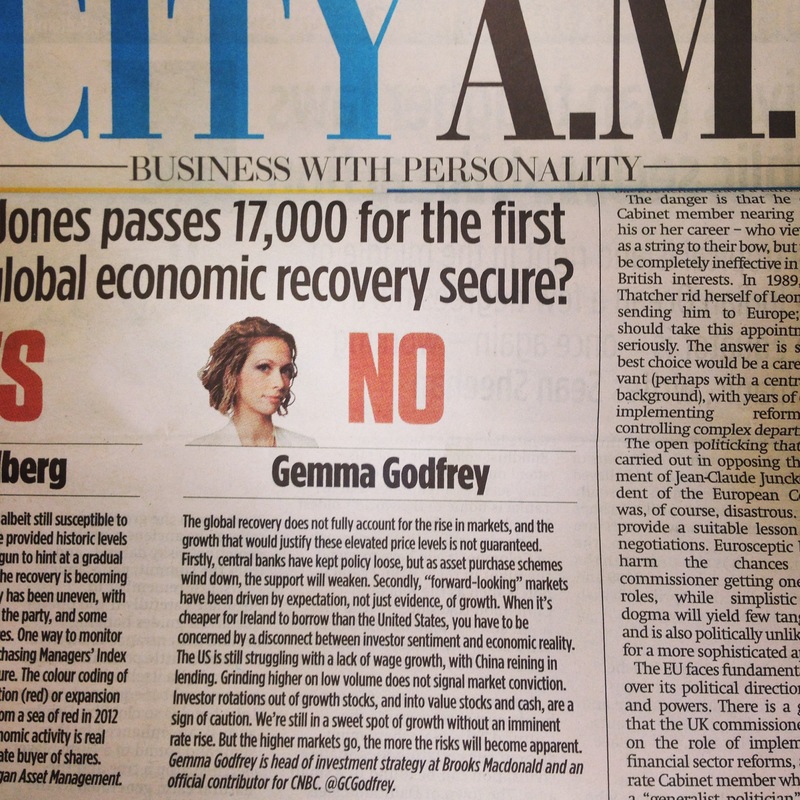 NO – The FTSE 100 has been rallying as the fear of risks, like a Eurozone exit or fiscal cliff stalemate, has receded. But growth is now needed for another leg up: there has been relief in the diagnosis, but the patient must now show signs of recovery. The concern for the UK is that it is tough to see a possible source of growth, especially after the latest economic figures showed us courting a triple dip recession. Looking overseas – as many FTSE companies do ­– the outlook for growth is more encouraging. But troubles in Europe and the US are far from over, as the former grapples with fiscal and banking union, and the latter with delayed spending cut decisions. Equities may provide value over the longer term, but you will have to encounter heightened volatility – and a likely correction – in the immediate future.